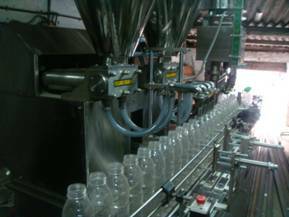 Mechanically Operated, Double head liquid filling machine to fill any liquid in bottles, tin, Jars and containers. Most suitable of Edible Oil/Ghee, Fruit Juices/squashes, Medicines and mobile oils. All Contact parts are of stainless steel and body of the machine is covered by S.S, Sheet form all the sides. Base wheels are provided for easier portability. Liquid filling machine is Semi-Automatic Volumetric Liquid Filling Machine Liquid filling machine is majorly used for filling free flowing liquids. Liquid filling machine also known as liquid filler and liquid dispenser which is suitable to fill 1ml to 5000ml of any liquid in bottles, cans, jars, tubs Liquid filling is automatic filling machine runs of volumetric filling principle. Liquid filling machine is widely used for milk filling, bottle filling, jar filling, container filling, oil filling, ointment filling, shampoo filling, juice filling, liquor filling, perfume filling, wine filling, can filling, food product filling by liquid filling machine is completely drip free and accurate in weight. Liquid filling machines are mostly used in pharmaceutical filling & food filling as filler or dispenser flavored milk filling machine and milk filling machine are major applications in liquid filler.